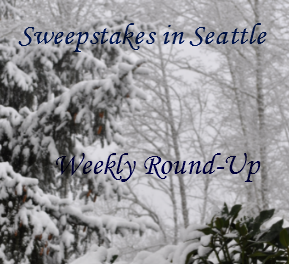 Sweepstakes in Seattle Weekly Round-Up 1/29 – Win $100,000, a trip to Hawaii, gift cards & more! It’s been a pretty great week for new sweepstakes. Did you have a favorite? I think my favorites were the sweepstakes offering a tropical vacation – I miss warm weather! I’d love to know what your favorite sweepstakes are. Do you like cash prizes, trips, cars? Let me know what you like and I’ll keep my eyes open for your favorite type! Remember, Sundays I will only post the weekly round-up so you can get caught up and see if you missed any of the sweepstakes posted during the past week. Have a great Sunday and check back tomorrow for new sweepstakes! I’ll also share winner’s stories here, so if you win a prize, let me know and you can be a part of the weekly round up! D won a 3-month subscription to Pandora Plus from the Dannon IWG! Colin won a 3-month subscription to Pandora Plus from the Dannon IWG!